Two brand new Ford Police Interceptor sedans and an SUV. Delivery was made on the new vehicles last week. Mayor Matt Ginn said the new vehicles are doing well for the department and have performed well in the snow. “They’re all-wheel drive,” he said. The new vehicles replace two 2006 Ford Crown Victoria cars that had increasing mechanical problems.. The cost of the new police vehicles is $100,000 with about half of that through a grant and about half from the city’s general fund. 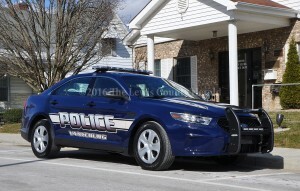 The Vanceburg Police Department has added three new vehicles to their fleet. Pictured with the vehicles are (L-R) Sgt. Joe Paul Gilbert, Chief Joe Billman and Mayor Matt Ginn.